One could say that the Alberta Rocky Mountain tradition of having tea on a mountain top began at Lake Agnes. Since 1905, the Lake Agnes Tea House has been serving, with pride, fine loose leaf teas to visitors from around the world. Lake Agnes was named for original First Lady of Canada - Lady Agnes MacDonald, the wife of Canada’s first Prime Minister. In 1886, Lady MacDonald visited Lake Agnes and was delighted by the beauty of this idyllic lake and the hanging valley it sits in. The Lake Agnes Tea House was originally built in 1901 by the Canadian Pacific Railway, as a refuge for hikers, and started serving tea in 1905. The log building was replaced in 1981 but still features the original windows, tables and chairs. Situated near Lake Louise, Alberta, Canada, at an altitude of 2,135 m or 7,005 ft, our Tea House is located in a lovely hanging valley on the shores of Lake Agnes. After a forested 3.5 km hike, with an elevation gain of 400 m or 1,300 ft, the valley opens to reveal spectacular Lake Agnes. 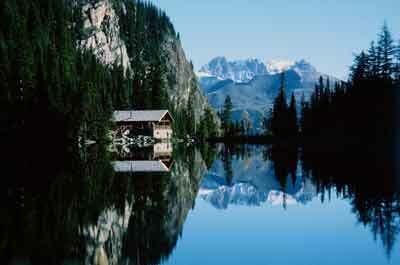 Together with Mirror Lake and Lake Louise, these lakes are often referred to as the 'Lakes in the Clouds'. For those preferring a less strenuous approach, horses are available for hire at Brewster or Timberline Stables in Lake Louise. A family run tea house, which was an Alberta Pride Alto Award finalist, Cynthia Magee's grandchildren will be joining her with their Mum, Joanna, and Dad, Pierre Luc, to welcome you at Lake Agnes with hearty homemade soup, sandwiches on freshly baked bread, and more than 100 varieties of delicious tea. Will the little ones have to hike down to school? Ask Jo!